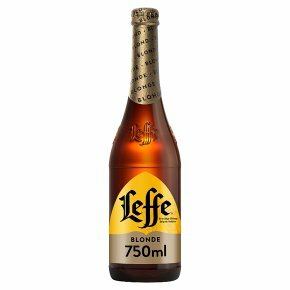 Leffe Blonde is light, aromatic and full-bodied, with delicate, carefully balanced aromas. It's a beer with a complex array of flavours such as gooseberry, quince and hints of fruit cake spices. Mildly sweet, its citrus flavour is the perfect accompaniment to cured meats, chicken or even creamy desserts. ?Smooth, subtle and golden in colour.? Leffe Blond is an elegant, smooth and fruity Belgian abbey style beer. It has a spicy aftertaste with a hint of bitter orange. While this is a perfect aperitif beer, it also tastes delicious with a wide variety of dishes, especially red meat, sweet and sour dishes and white mould cheese, such as Camenbert, Brie, Brillat-Savarin or Saint-Marcellin. There are countless soft-centred cheeses that are a good match for the fresh and fruity Leffe Blond. Leffe Blond is best served at 5-6°C in a beer chalice, which will allow all the flavours to come through.